Following the success of Pimlico’s A.Wong, which won a Michelin star last year, chef Andrew Wong has opened a second, more laid-back restaurant, this time located in Bloomberg Arcade, London’s new culinary and cultural destination – also the site of Bloomberg’s European headquarters – designed by Foster + Partners. 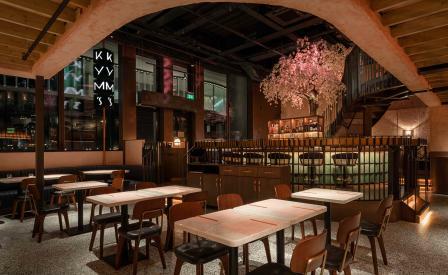 Called Kym’s, after the original restaurant that Wong’s parents owned for 27 years, this iteration slots nicely into its contemporary setting, thanks to international firm, Michaelis Boyd, which has created a stylish interior layered with subtle Chinese inflections. The two-floor space features a mix of dark woods, speckled terrazzo flooring, natural plaster walls and decadent furnishings, which include crushed velvet banquettes and leather ‘Utility’ dining chairs by Neri&Hu, in blush pink and deep plum tones. The highlight is the semi-circular copper-topped bar – clad in reclaimed turquoise roof tiles – that sits beneath a dramatic cherry blossom tree, but the best seat in the house is at the bar of the open kitchen, where you can watch the chefs in action as they meticulously carve slabs of deliciously crisp roasted pork belly and plate up pretty dishes that Wong says: ‘hark back to the nostalgia of original Kym’s menus, with sweet & sour elements and more rice-based dishes’. With a focus on a wider, more relaxed menu than at A.Wong, here, small plates like the silken tofu and century egg topped with garlic soy; sticky sweet & sour ribs; and light french bean fritters are followed by sharing options such as the delicious crispy duck pancakes. Don’t miss out on the classics – like the slow poached soy chicken or the tender Iberico pork char sui – that are based on the ancient craft of Chinese ’roasting’ meats.